Beautifil II is a fluoride-releasing, light-cured, nano-hybrid composite indicated for Class I-V restorations, wedge-shaped defects and root caries, direct laminate veneer, core build-up, and repair of restorations. The manufacturer classifies it as a GIOMER, an esthetic restorative material that combines the characteristics of both composite and glass ionomer. Beautifil II is resin-based, containing filler particles that are derived from S-PRG (Surface Pre-reacted Glass Ionomer) technology. The average filler particle size is 0.8 μm with a range of particle sizes from 0.01 to 4.0 μm. The filler content is 83% by weight and 69% by volume. Incremental layering and light curing are advised for placement of Beautifil II in a manner typical of traditional composites. A fluoride-releasing bonding agent like FL-BOND II is highly recommended. 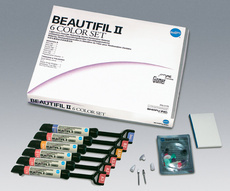 Beautifil II is available 12 shades: A1, A2, A3, A3.5, A4, B1, B2, C2, Incisal, BW, A20, and A30. Itis packaged in kits containing six-color, 4.5-g syringes or 120 unit-dose tips, Dura-White Stone, Super-Snap Single, and OneGloss Trial Set. Twenty-six clinical consultants evaluated Beautifil II in over 700 procedures. This product received a 94% clinical rating. Quality of final polish, ease of finishing, final esthetics, and packaging of Beautifil II were rated very good to excellent by all consultants. There is no noticeable shade shift after curing, and the cured composite has a good amount of translucency, allowing it to blend well with the tooth. The material has a workable viscosity for easy placement and shaping. Some consultants noted that Beautifil II is sensitive to ambient light, limiting the amount of time the material can be manipulated. Generally, consultants found Beautifil II was especially useful for children and patients with high-caries risk, where high fluoride release is important. Seventy-three percent of consultants rated Beautifil II equivalent to or better than the current product they were using, and 70% would recommend Beautifil II to their colleagues. Dim overhead light source when packing material to prevent premature curing. OneGloss (Shofu) gives restorations a nice luster.